In the meantime, I'm super excited to share some of my favorite images from a recent family session taken in northeast Iowa. This little cutie pie just turned two and I was overjoyed that his parents chose me to document this happy milestone for him. Photographing a two-year-old is fun (and a workout)! ;) He was quick on his feet and sweet as can be, and I just LOVE all of the candid in-between shots that I got along with the posed ones. We lucked out with a breezy cool summer morning and started our session with a walk along the Turkey River. Sometimes it takes a few minutes to warm up, and that's okay. or a pep talk from Dad. Can we say, heart-breaker in the making? just before a game of peek-a-boo! The days are long, but the years are short... and I hope these folks will look back on these images and smile at the memory of their precious, inquisitive, oh-so-handsome TWO-year-old for years to come! Thank you for having me document this special season for y'all; it was a joy to spend time with you and so fun photographing your little one! Many blessings and best wishes for a year filled with adventures, play, laughs, and love! Opening night at The Left Bank - This Friday the 13th! I love that The Left Bank Shop and Gallery sends out little reminders about upcoming special exhibits. Mine's currently on the fridge, so I don't forget! Join in the fun for the opening night and you'll enjoy music, refreshments, art, and meet these creative couples for yourself! Also, if you missed out on the last opening night, you can have a sneak peek at the fun that takes place on an opening night over on my blog post HERE: New Season New Art. It's always fun, promise! 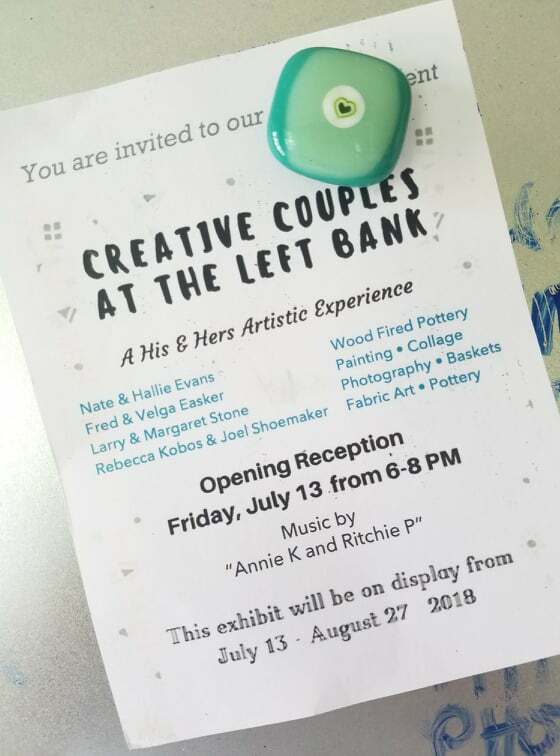 So, be sure to make it over to The Left Bank this Friday, July 13th, from 6-8 PM for the opening reception of "Creative Couples" ---- an exhibit featuring couples who create artwork in and around NE Iowa! When new friends visit our home for the first time, they get a tour of the rooms AND all of the art on the walls (if they want). Being an artist, many people initially wonder if the work throughout my home is mine or created by other artists. The answer is: both! I am always rotating my own artwork between various galleries, exhibits, and have a few pieces that are in my own "permanent collection." Over the years, I have also fallen-in-love with several other pieces and collected from other artists. I genuinely feel a connection to the artwork on my walls and therefore to the people who created it, too. If you've never purchased an original piece, try it! You'll be surprised by what even a small piece of art can do for your soul. 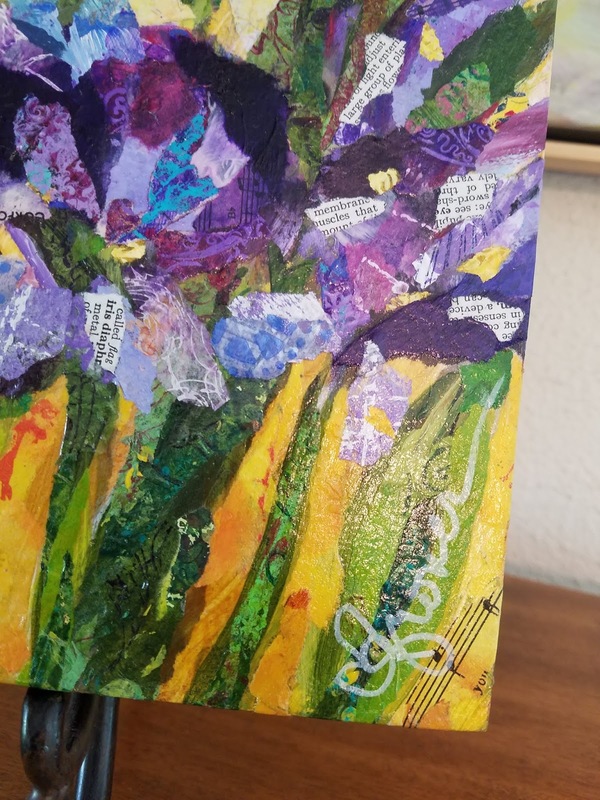 Today, I'm sharing my most recent art purchase, "Purple Iris" by Kris Grover - Luna Fiber Artist, Co. I love Kris's torn paper collages for their vivid colors and attention to detail and I feel like they have a similar whimsical quality to my own art. I enjoy looking at this darling piece and it brightens my mood on a daily basis! When people say they don't have any more wall space, I feel their pain... BUT that doesn't stop me from finding the perfect location for something that speaks to my heart. Sometimes you just have to get creative. 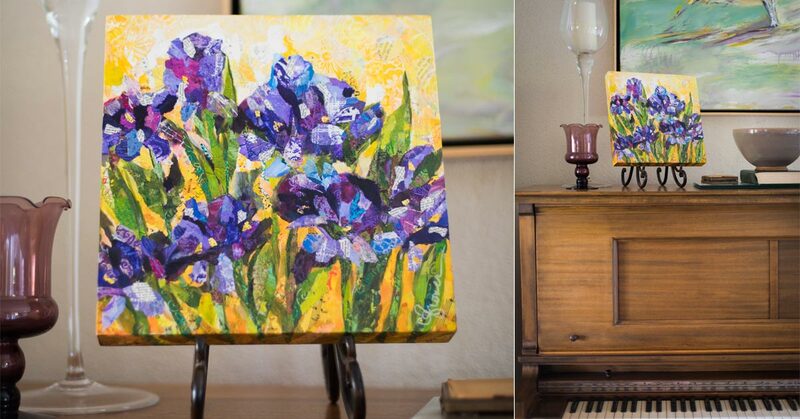 Luckily, the music notes hiding in Purple Irises encouraged me to redecorate the top of our piano. ♥ Thanks for making beautiful work, Kris G! Art in the Park Fine Art Festival is set for August 18th and 19th in Founders' Park, Elkader, IA! You can find me, Kris, and many more local and regional artists selling a variety of media and styles of artwork, and you get to meet the artist, too! Where's your favorite place to shop ART? !